Explore Hereford's famous Mappa Mundi & unique medieval treasures. Hereford Cathedral is home to the Hereford Mappa Mundi, one of the world’s unique medieval treasures. Measuring 1.59 x 1.34 metres (5’2” by 4’4”), the map is constructed on a single sheet of vellum (calf skin). Scholars believe it was made around the year 1300 and shows the history, geography and destiny of humanity as it was understood in Christian Europe in the late thirteenth and early fourteenth centuries. The inhabited part of the world as it was known then, roughly equivalent to Europe, Asia and North Africa, is mapped within a Christian framework. Jerusalem is in the centre, and east is at the top. East, where the sun rises, was where medieval Christians looked for the second coming of Christ. The British Isles is at the bottom on the left. The Hereford Cathedral Chained Library is the largest surviving chained library in the world. In the early seventeenth century, chained libraries could be found in universities and cathedrals, but this is the only one still to be chained. It contains about 1,500 books, dating from around 800AD to the early nineteenth century, including 227 medieval manuscript books. The books are still read by scholars who come from all over the world to study them. 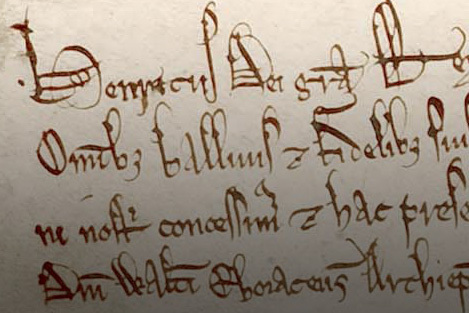 The Great Charter of Liberties or ‘Magna Carta’ agreed between King John and his barons at Runnymede near Windsor in 1215 is one of the most famous documents in history. It is considered the foundation of English common law and much of its worldwide importance lies in the interpretation of the clauses from which grew the right of the freedom of the individual. The Hereford Mappa Mundi Trust was formed in 1988 for the long term preservation of Mappa Mundi in its ancient home at Hereford Cathedral. Endowed with significant support from the National Heritage Memorial Fund, Sir Paul Getty and members of the public across the world, the Trust oversaw the completion of the New Library Building in 1996, where its support for the conservation of the cathedral’s unique collections continues today. Today’s building contains some of the finest examples of architectural excellence from Norman times up to the present day, including the Romanesque Nave, the beautifully restored Shrine of St Thomas of Hereford in the north transept, the ancient south transept and the award-winning twentieth-century New Library Building. New commissions also include the gilded and painted shrine of St Ethelbert and four stunning stained glass windows dedicated to the life and writings of seventeenth-century cleric and poet Thomas Traherne.